Agilent Technologies Inc. (NYSE: A) recently announced the M9036A modular PXIe embedded controller. The M9036A is a compact, three-slot controller designed to take advantage of the x8 PCI Express(r) links when using the Agilent M9018A PXIe chassis. Together, the M9036A controller and M9018A chassis provide customers with the highest-throughput PXI test platform for peer-to-peer applications. This platform is capable of integrating legacy PXI instruments into the hybrid slots of the chassis while providing up to 8 GB/sec of system bandwidth with dual x8 express links to handle the most demanding RF, uW and streaming applications such as the need to transfer data between cards without involving the controller. The controller can also operate in a four-link configuration, providing compatibility with existing PXIe chassis. The M9036A was designed using an Intel Core i5 2.4-GHz dual-core processor with Hyper-Threading Technology, with a removable 160-GB solid-state drive and 4 GB of RAM (upgradable to 8 GB) in the standard configuration. This configuration gives customers working in multitasking environments the required performance, optimum flexibility and increased reliability compared to conventional rotating hard drives. The built-in front panel connectors enable seamless integration with traditional standalone instruments to create sophisticated hybrid test systems. This is done using USB and LAN, or DVI-I, GPIB, ExpressCard 34 and an SMB trigger connector. The controller module expands Agilent's current offering in PXI and gives customers the choice of an external controller or the new embedded controller for integrated, compact solutions. The M9036A is preloaded with operating system, controller and chassis drivers, Soft Front Panel and Agilent I/O libraries, including VISA, Agilent Connection Expert and I/O monitoring. This allows users to quickly communicate with and control both modular instruments and standalone instruments. "The new PXIe embedded PC controller is fully PXI compliant and is a perfect complement for the Agilent M9018A PXIe chassis, enabling customers to take advantage of the fast data-transfer rates across the backplane," said Carla Feldman, marketing manager of Agilent's Modular Product Operation. "The M9036A is designed to support customers who are looking for a flexible, transportable and fully integrated PXI test setup." The M9036A adds to Agilent's fast growing line-up of more than 50 PXI and AXIe modular products . The M9036A starts at $6,600 and can be ordered now. Additional information about Agilent's modular test solutions is available at www.agilent.com/find/modular. Product photos are available at www.agilent.com/find/pxie-controller_images. An in-depth Agilent modular products backgrounder is available at www.agilent.com/find/modular_backgrounder. 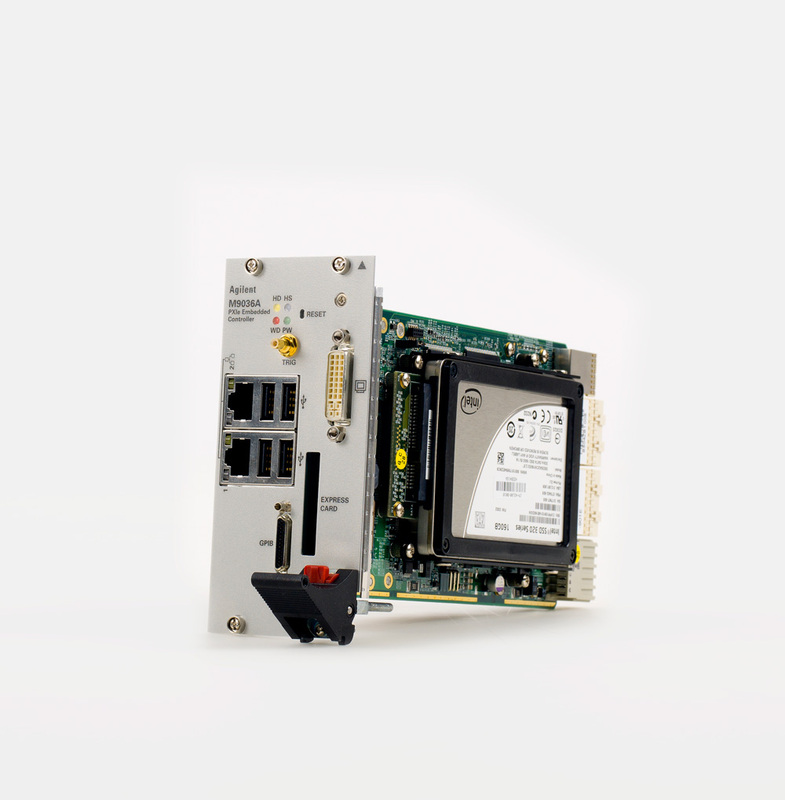 PCI eXtensions for Instrumentation (PXI) is a modular instrumentation platform designed for test, measurement and automation applications that require high performance in a small, rugged industrial form factor. With PXI, users may select over 1,500 modules from over 70 vendors and easily integrate them into a single PXI system. An industry standard, PXI is managed by the PXI System Alliance, an open consortium. Information about the PXI System Alliance is available at www.pxisa.org. PCI Express is a U.S. registered trademark of PCI-SIG.